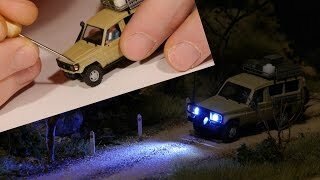 I’ll show you how to install the Woodland Scenics Nano LED’s into a HO scale vehicle. I’ll also demonstrate how I add a driver inside the car and a neat way of blocking out any unwanted light from the small gaps around the vehicle. This is a great project to add detail and life to your model railroad or other scenery diorama and it will only take an hour or so to complete. where I regularly post additional information and articles related to model railroads and scenery dioramas. All other tracks from YouTube audio library.